The Westin Palace offered a Starwood Preferred Guest (SPG) “Cash & Points” rate during our weekend in Madrid. SPG’s “Cash & Points”, which allows a combination of points and currency to be used to pay for a stay, often provides the best redemption rates on rewards. They aren’t frequently offered, especially in Europe. The availability of a low cost option for us to stay in Madrid at a luxurious hotel actually led us to extend our planned stay in Madrid by one night, and ultimately led to our selection of the Westin Palace. In fact, we did not perform any of our usual hotel research for Madrid. The Westin Palace clearly shined as a reputable hotel with a prime location adjacent to the Prado Museum. Price. The cash rate offered during our stay was €245. Accordingly, in our particular situation, the $90 + 4800 points “Cash & Points” option was nearly a 5% reward rate ($/points). For SPG credit card holders, this is a great value for reward points (compare to the 1% and 2% reward options most credit card companies offer). For those seeking to pay the cash rate for a stay at the Westin Palace, the hotel probably offers a value on par with similar international luxury brand hotels in Madrid. Location. The Westin Palace is in a great location in the Museum District of Madrid. The Prado is literally across the street, and lively Plaza de Santa Ana is a short 10-minute walk with plenty of excellent dining options. Although the Museum District has plenty to offer, it’s not exactly central. Ironically, the Royal Palace of Madrid is on the opposite side of the city center, over a 20 minute walk from the hotel. Plaza Mayor, also west of the city center, is about 15 minutes. Without better knowledge of the accommodation options in the center of town, however, I wouldn’t necessarily argue that the Museum District is not a good location. Our room at The Westin Palace was modernly furnished and decorated with enjoyable prints of Spanish landscapes and people. Room. We stayed in a recently renovated Deluxe Room. Our SPG Gold Status earned us an upgrade from a room without renovations (at least that’s what we gathered from the reception desk). The room was very modernly furnished, with several enjoyable prints of Spanish landscapes and people for decoration. The bathroom was adorned with natural stone and equipped with luxury fixture. Our room overlooked the main intersection with the hotel. There was no balcony, but there was a small place to sit next to the window for people watching. Other than the lack of an outdoor space, we had no complaints about our accommodations. Dining. There are several food & drink options at The Westin Palace, but all were out of our price range. We did splurge on one round at the bar (cocktails were as much as €20!). We managed breakfast on our own, however. We were excited about advertisements for a terrace with drink service both on the web and in the hotel elevators. The terrace ended-up being a complete disappointment. Firstly, it took a confusing and circuitous journey through the hotel’s fitness center on the top floor to reach. Then, upon arriving, there were just a few tables with practically no view and a telephone to the lobby for drink orders. We also did not eat breakfast at The Westin Palace, as the buffet cost an excessive €45. If you plan on staying at The Westin Palace and have a limited budget, plan on finding dining options elsewhere. Amenities. As a 5-star hotel, The Westin Palace offers plenty of amenities to guests. The fitness center we walked through on the way to the disappointing terrace seems fairly complete, and can be access free-of-charge. As SPG gold members, we were able to get free wireless internet as our “gift”. For non-SPG members, expect to pay an exorbitant €19/day, which is sadly in line with other international hotels in Europe. Although not inside the hotel itself, there is a Starbucks and a Vips cafe (to-go sandwiches, drinks. etc.) in the same building that are very convenient. I suspect next time we are in Madrid, we will likely decide to stay at an independent hotel or B&B, unless a limited budget and/or a superfluous SPG account balance motivates us to return to The Westin Palace. Although The Westin Palace worked for our situation on this trip and offered a good location for exploring Madrid, we miss the character of more local establishments and do not believe their cash rate offers guests a great value. 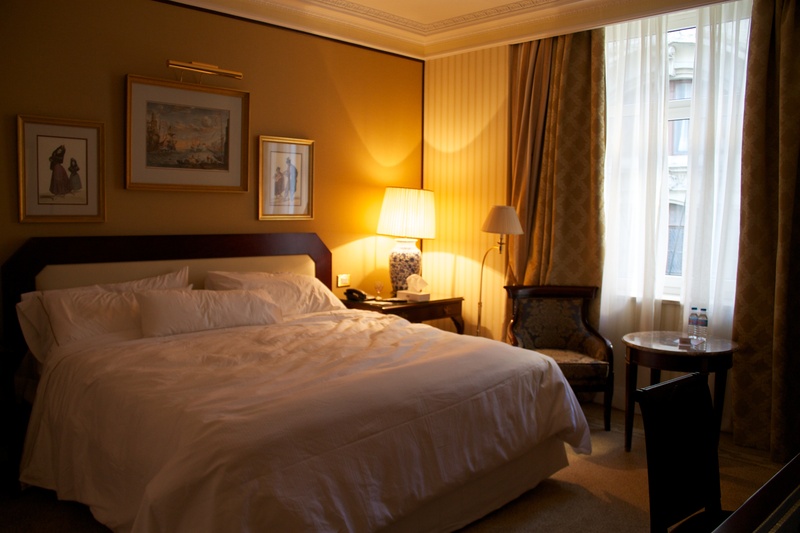 This entry was posted in Hotel Review, Travel and tagged Europe, hotel, Madrid, Portugal/Spain 2012 Trip, Spain by Ryan. Bookmark the permalink.